OVERSOUL: Alpha Testing has Begun! Battle Fixes - Should significantly lower your chance to get into a "dead battle" that requires a re-login. Server Speed improvements - Database Traffic has been isolated and should not slow down the rest of the game. New Characters! - 5 new characters will be capture-able today. New, more flexible spell effects animation system. Remember, this is an early alpha of the game, it's feature set is completely unfinished and not finalized. We'll be making big changes and the server is by no means totally stable. We'll do our best to keep the game up and playable as much as possible from now on, though, so it should be fun to see how this goes. By the way, both Stress Testers and Alpha Testers will get their own exclusive characters as thanks for supporting our game. One is shown below, the other I'll reveal tomorrow in this same post! Both will be Neutral Alignment. OVERSOUL: Alpha Reward is Released! 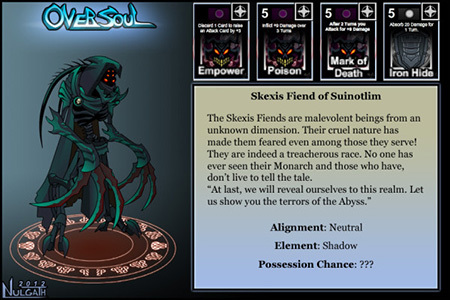 Welcome the Skexis Breed of Fiends from another Dimension. This character's base element is Shadow but he is the FIRST character with a mixed Elemental card of Neutral: Iron Hide! You will need to power up your Neutral Energy to use this card and then switch back to powering up your Shadow Element for his shadow cards! Good luck on switching your element powers! Search for him on the world map now! Ahoy Oversoul Players! Since we're still in the Alpha testing phase & it's Talk Like a Pirate Day, as a last minute surprise I am releasing a seemingly impossible character to release but I'm the captain of this ship so anything and everything is possible. Alpha Pirate will come to Oversoul! He will be one the hardest characters to possess yet. No one knows where he can be found and even if you do happen to find him... good luck trying to possess him. He'll be well worth the effort if you like shooting your enemies with a pistol and trying out the newest element to the game, Water. Worry not, even if you can't find him, know you'll always have a chance to find him as he's not going to leave the game anytime soon! Arrrgh... good luck ye scallywags... you'll need it! Note: The Fresh Start card special is not functioning right now so is not in-game. Fixed a bug that caused PvP Battles to freeze while loading. Fixed several battle errors that were caused by server - desyncs. New music was added to the game. "Counter Strike" Special added to Spear Native and Recruits. Battle engine revision: New play order for cards: DEfense, attacks, spells. Fixed a bug that caused incorrect spell effects to play at the wrong times - this also caused desyncs. There's new sound effects for spells. You'll also notice a sound effect for your card movements. The Alpha Pirate is getting antsy and might change his hiding spot soon. Don't worry, your keen trackers will still be able to find him but he won't be where he was. Until next week enjoy! Update: Discard Feature, Mod Tools... & Starting Energy? Bet you've you'll never be so happy to see an X in your life! Yes, finally you will be able to discard the cards you don't want to put into play! But after todays release you'll be happy to use Iron Hide, I promise! Devs will have Green Names - Anyone who is a member of the Oversoul team will get a green name. Mods will have Gold Names, like AQW. You now start every battle with a Neutral Element charge of 4. - This will make it easier for mixed decks that have neutral and elemental card types! Charge caps - you will be able to charge a max of 5 points per turn in an element. Max Charge Value: They highest charge value will be 20 points in an element. Artifacts and stats( coming soon) will allow you to increase these and other values). Battle Rewards: experience and Gold. Character levelling - Characters will evolve into Veteran, master and Legendary types. New Characters and Card types are constantly being worked on and added. In Game purchase system for Artix Points. The Alpha Pirate is on the move! After todays update, he'll be somewhere else on the map!